Pre-concert Reception at 6:30 PM / Concert at 7:00 PM. Seating is first-come, first-served. The inaugural season of the Key Biscayne Piano Festival at Crossbridge Key Biscayne — in collaboration with Miami International Piano Festival. Featuring five solos and two duets, the 2018-19 Key Biscayne Piano Festival presents intimate performances by international artists, from Belgium, France, Italy, Russia, Spain and Venezuela, with each program hosted by Professor Frank Cooper. 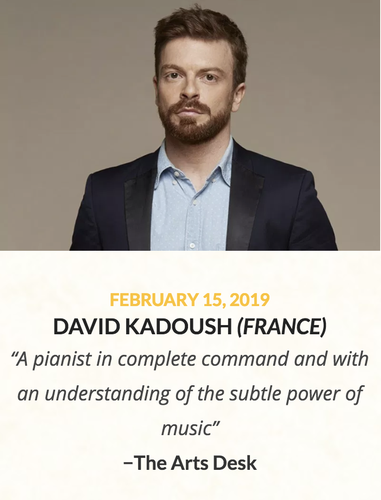 The performance on will be showcasing David Kadoush a composer, conductor and pianist from France. Gourmet ticket holders will enjoy a gourmet tasting & prosecco reception before the concert provided by Puntino Key Biscayne at 6:30 PM. There are two ticket types available for purchase: Concert Ticket: admits one adult or child to the concert only. Gourmet Ticket: admits one adult or child to the concert as well as a gourmet tasting & prosecco reception provided by Puntino Key Biscayne at 6:30pm (before the concert). • Prosecco, red & white wine, water and pizza by Puntino will be for sale during the intermission. • Piano Festival performances are a formal affair calling for business/cocktail attire. • Children 8 and up are welcome to attend, and Crossbridge babysitting services are available. • Community service hours are available for student volunteers.